CUVÉE Magazine No. 4 | ALSACE puts a spotlight on the region of Alsace and its terroir diversity. Limited by the natural frontier of the Vosges mountains descending to the west and the important Rhine river to the east, Alsace was a frequent battlefield for territorial conflicts and war. Alternating between French affiliation and German occupation several times over history, the region’s identity has been built and shaped by both cultures equally – blending Germanic business acumen, diligence, precision, attention to detail and reliability with the French culture of reflection, philosophy, savoir-vivre and sense of place. In this edition you can sip right from the glasses of Alsace, story by story, to explore the highlights, shades and contrasts of the region – far from the omnipresent colorful studwork architecture cramped into picturesque villages full of uninspired traditional tourist kitsch. Inspired by the outlines that a few pioneers and visionaries had drawn in the past, a new generation is just coloring in a new picture of Alsace, using the well-studied nuances of their almost intimidating terroir diversity and framing the artwork with a new dynamic and widely implemented organic farming practices. CUVÉE Magazine uncorks numerous bottles of Alsace wines throughout the fourth issue and tells the remarkable stories of a fine selection of wines, their provenance and the people who have marked them. Each issue is dedicated to one wine region only, showcasing its unique soul through a selection of portraits, interviews, opinions, philosophies and remarkable anecdotes. Read stories about heritage and origin and dive deep into the diversity of wine philosophies, cultural and culinary heritage, wine styles and a vast range of selected producers that show the bandwidth of the region. 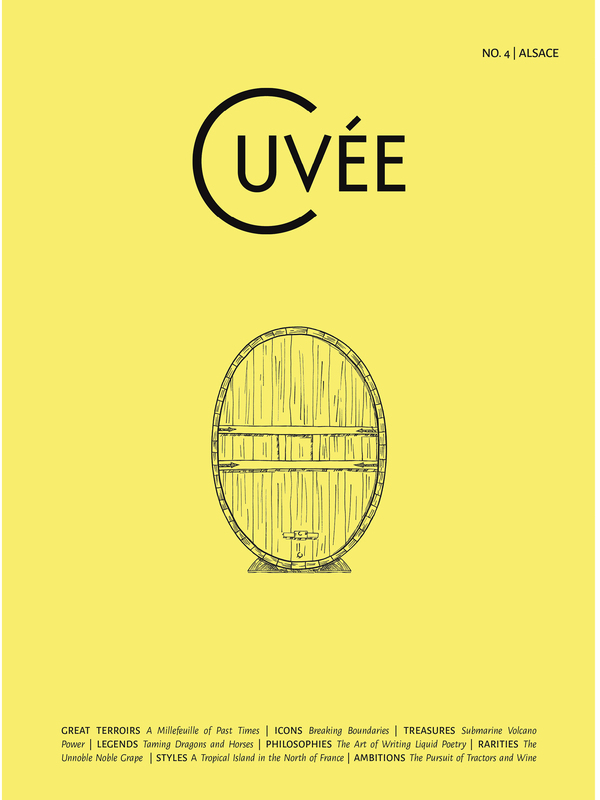 CUVÉE Magazine is available through our online shop with free worldwide shipping so you don’t have to leave your wine cellar, and through a selected network of stockists.